The legendary energy drink Red Bull is rolling out three new flavors across the U.S. market to provide its fans with an opportunity to celebrate spring with their favorite tastes. 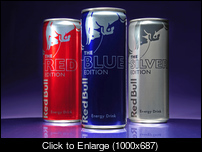 The new range, Editions from Red Bull, includes three specific flavors—cranberry, lime and blueberry. The new varieties are arriving nationwide after initial test market launches in select cities in November-December 2012. The Editions from Red Bull, which provide the same amount of energy and the effect of the original drink, are available as single 8.4 fl oz cans and 8.4 fl oz 4-Packs, the prices are set on the same price level as the other offerings from the brand. Each of the new tastes corresponds to a different color of the can—red for cranberry, silver for lime and blue for blueberry. Red Bull has been present on the U.S. market for 15 years, and it is the first time it has decided to introduce an alternative to the original flavor. Prior to the official launch, Red Bull tested the new products on select markets within the country during six weeks in late 2012. The pilot launch proved that “with perfect in-store execution, the Red Bull Editions had the power to grow the entire energy drink category by more than five percent,” states the company in the press note. The new products were successfully sold at the participating stores and even managed to get featured in the top 25 of Energy Drinks ranking. As much as 70% of surveyed consumers reported that their repeat purchases of the drinks were driven by the product’s taste.